In this week’s expert spotlight, we head to the Connecticut River Valley for an insider tour of modeler Paul Dolkos’s HO train layout based on the New Hampshire portion of Boston & Maine Railroad. Paul’s scene, constructed in HO train layout scale and completed over the course of 13 years, is modeled after the tiny towns and river ports you’ll find when traveling the Connecticut River. Paul spent some time with us and walked us through some of the most impressive features in his model. To reach the rolling hills and quaint downtowns of Paul’s scene, one need only travel back in time. All the way back to November, 1952, to be exact. Paul says he picked this particular era for his HO train layout because he wanted to capture the beauty of B&M Railroad in its prime. Home to small industries and picturesque vistas, B&M New Hampshire was to Paul the ideal location for a project that he knew would take him more than 10 years to build. While he was drawn to an engine from the era that was commonly found on the tracks of B&M, it was the stops along the way that made his subject matter a no-brainer. With such remarkably New England touches as stone fences, covered bridges and white birch trees, the choice for his next HO train layout seemed simple. Featuring a main line that measures roughly 80 feet long and operates both steam and diesel locomotives, Paul’s HO train layout of B&M New Hampshire has the capacity to run up to a dozen trains simultaneously. 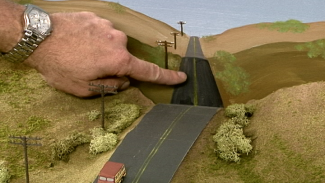 As part of his tour, Paul takes us into town and shows off several of his favorite components of his HO train layout, from the scratch-built homes and stores that line the central avenues to the breathtaking landscape that leads engines into and away from town. 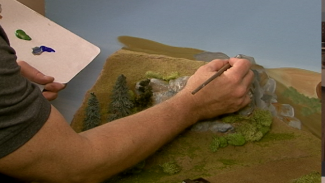 Come along and get your behind-the-scenes look at Paul’s spectacular model!